I found this Finch pencilled, Castro inked image and fancied adding some color to it. Think it looks not bad. tried a couple of different techniques here with varying success. The background is done in same fashion as my recent spidey pic but the resulting cloud/fog layer has been stretched horizontally and recolored to form clouds. Another Digital Coloring, this time of a Craig Rousseau drawing. I removed some of the original background lines,but kept the spirit of it with my effects. 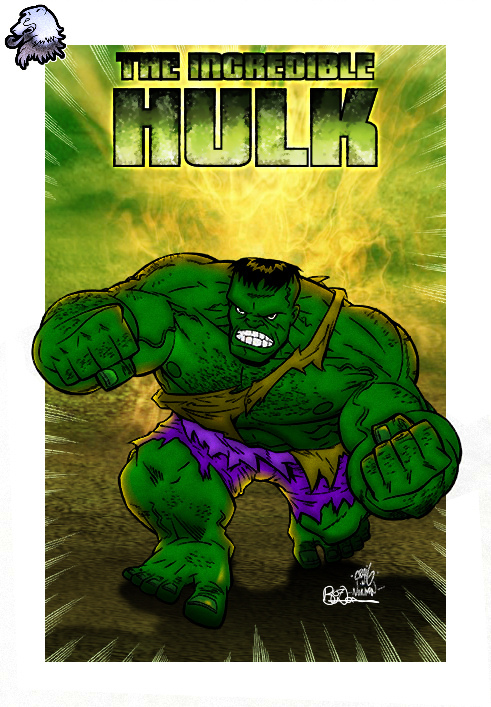 This started out as a pic of bodybuilder Orville Burke, I liked the pose and figured it might make a good Hulk. 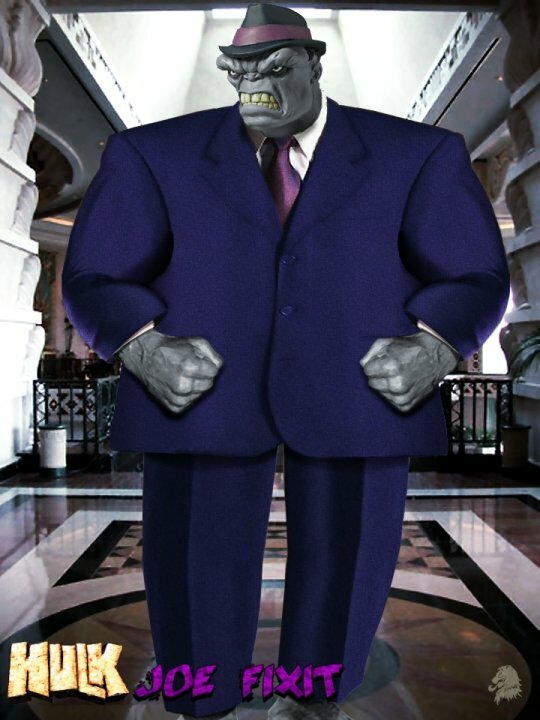 I cut him out of his original background and colored him green. His proportions weren’t quite right for the hulk so I cut and enlarged his hands/forearms and his calfs using smoothing and cloning to get back the missing detail. 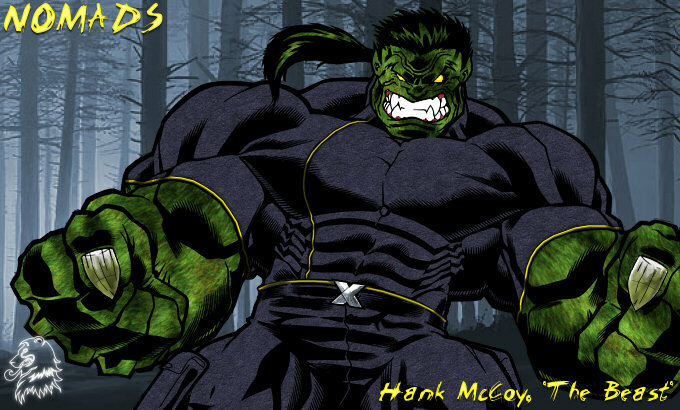 The head is taken from a teaser photo of the hulk that was released yonks ago. I upped the brightness by duplicating the pic onto a couple of new layers set to screen. The head was then cut out and positioned over orville’s. I had to tweak the colors a bit to get a match. Over the top of this lot I put a leathery skin texture for some additional depth. The pants were created in my usual manner of multiple layered textures and shaders. 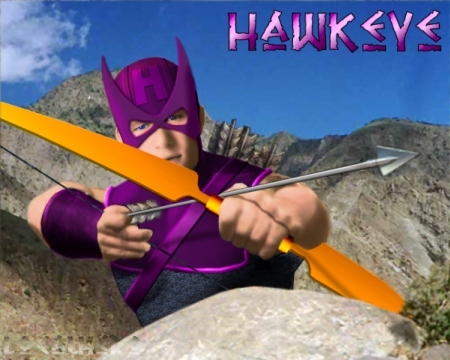 The background was a random Nevada desert shot from the net. 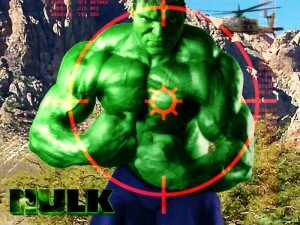 The helicopter is one of the ones I used previously in my Ultimate Hulk/Cap pic a few months ago. The target sights created using vector shapes and set to screen. Added some text to show range/speed etc and on the other side of the target is a list of random numbers. 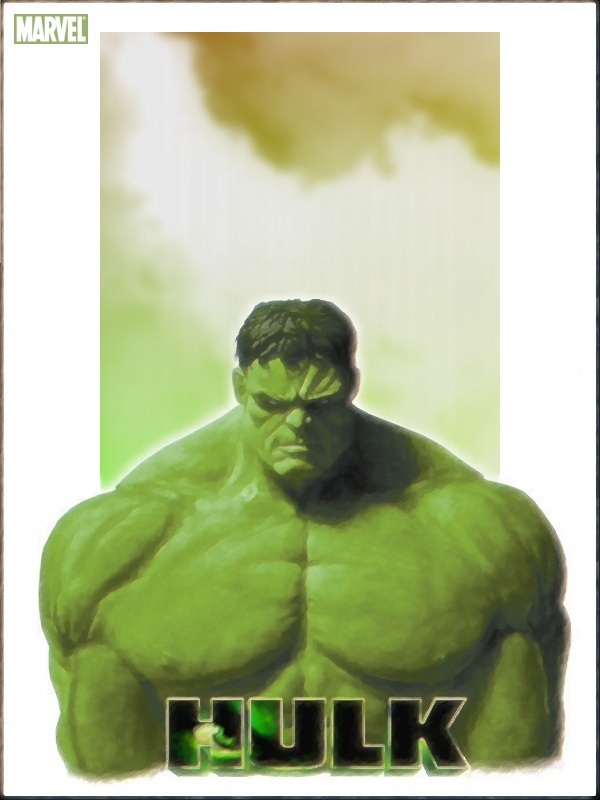 The hulk logo was pieced together from the logo in the hulk movie site. 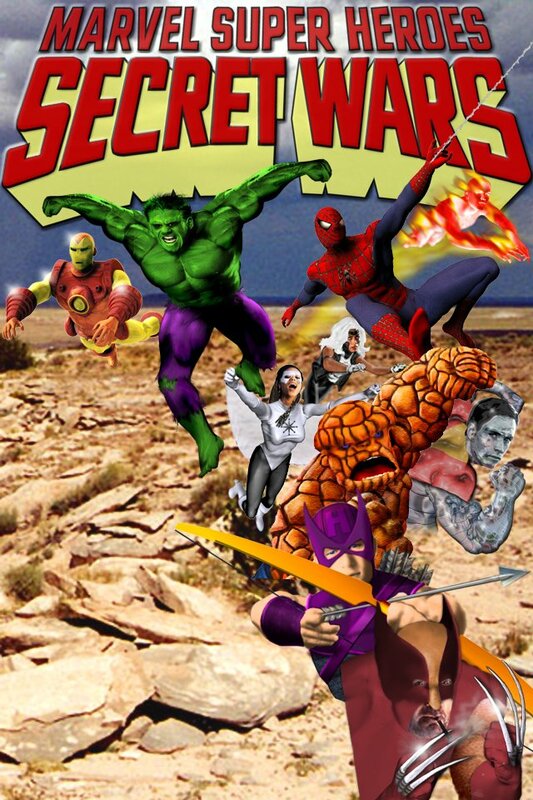 The hidden battle from Secret Wars. 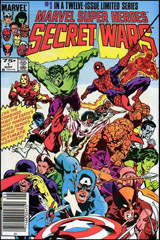 What we didn’t see was Hulk and Thing going toe to toe on a mountain top as the Beyonder looks on in the background through his rip in space. The latest in my digitally colored works began as an inking by Bob McLeod. The basic coloring is done using a version of the texture on a color, and one on a multiply layer. Additional highlighting done. In order to get some depth to the colour I used added some noise on an overlay layer. 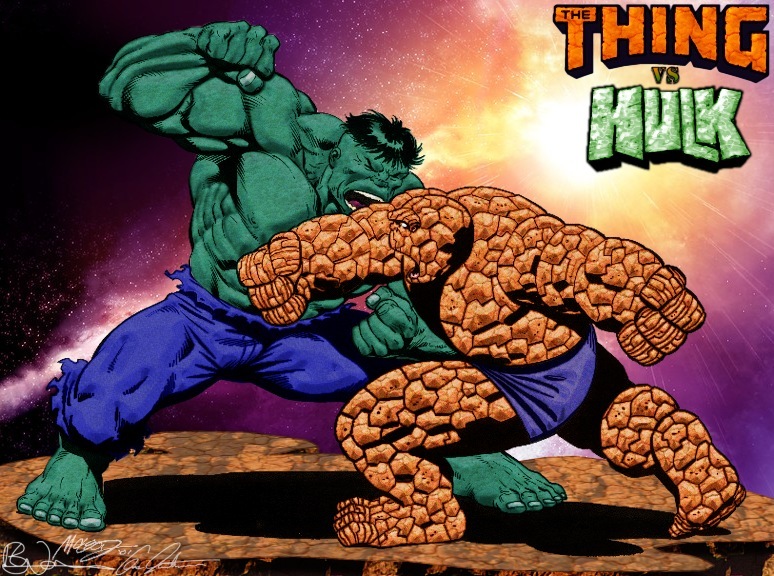 The logos were altered from the Marvel Versions by use of additional colour and texture. The background is cut from an image called Celestia III by Gene Martin (signature done in vectors from original). I liked how this turned out so much.. I signed it myself too rather than just putting my logo on it. 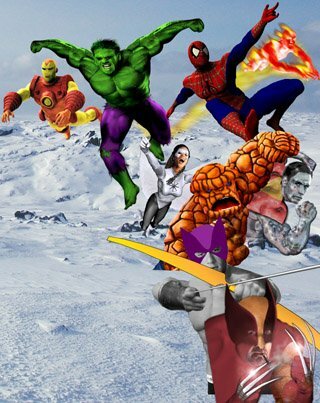 This is a little bit of fun I had early this morning.. it’s amazing what an inability to sleep can do for creativity! I wanted to do a bit of practice with perspective, so I found the pic of the desktop on Google. Then I layered on some of my recent pics and even some works in progress I am currently working on. Using the freeform deformation tool, I tried to match the perspective of the desk and pc screen. I added the C2F logo to the cup by deforming it, then cutting the top and bottom of the square logo pic to give a curved edge. then I darkened the furthest away edge multiple times as it curved round the cup. this layer was set to softlight. I duplicated the logo layer and set it to color. the art page shadows were done using the vector tool to draw straight black lines which were blurred. the shadow of the page hanging over the edge of the desk was done using a gradient fill. the cap/wolvie pic i did recently i tried to make look like a comic by duplicating that layer a couple of times offset slightly. A little bit of cutting of my first Invisible Woman pic and a new shadow, and the pencil looks like it is on top now. The WIPs showing are all based on Tom Derenick sketches. 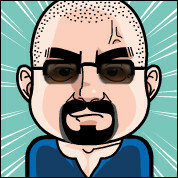 Just a bit of fun, but surprisingly effective. I am definitely going to use this to frame other art in future. Latest in my digitally colored and textured series. This one was a pencil drawing by Jose Vicente Torres Hernandez. The eagle eyed among you may spot a background i have used before. The hardest part of the whole coloring was deciding how vivid to make the backdrop. 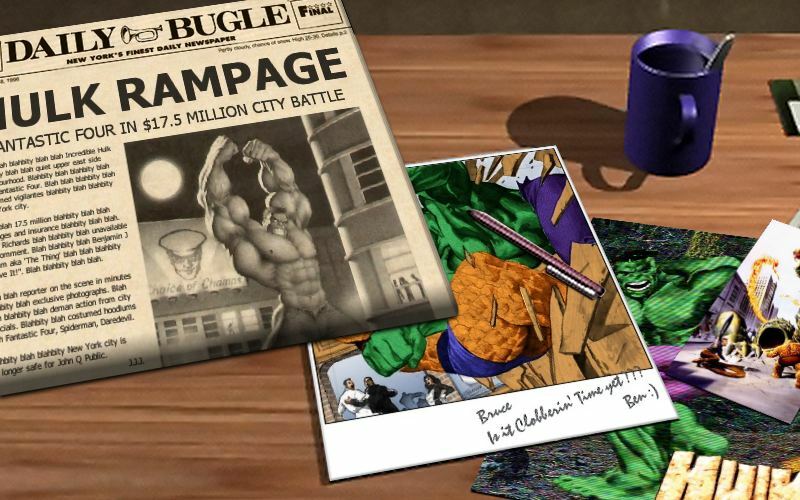 Third and probably final piece in this series, just a chance to see the Bugle from Thing’s desk in a bit more detail. 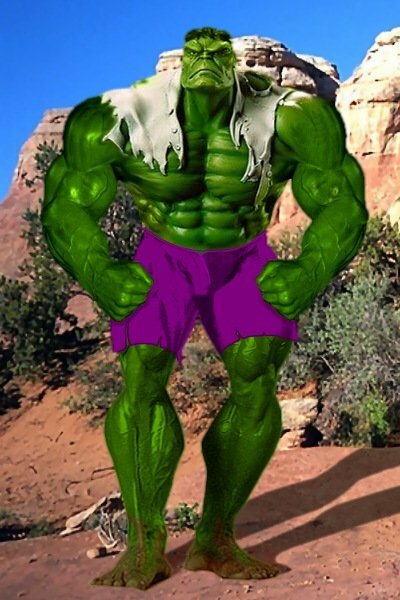 The hulk pic is a Jim Sweet picture. A closer look at an element from yesterday’s image. Another digitally colored and textured Tom Derenick piece. 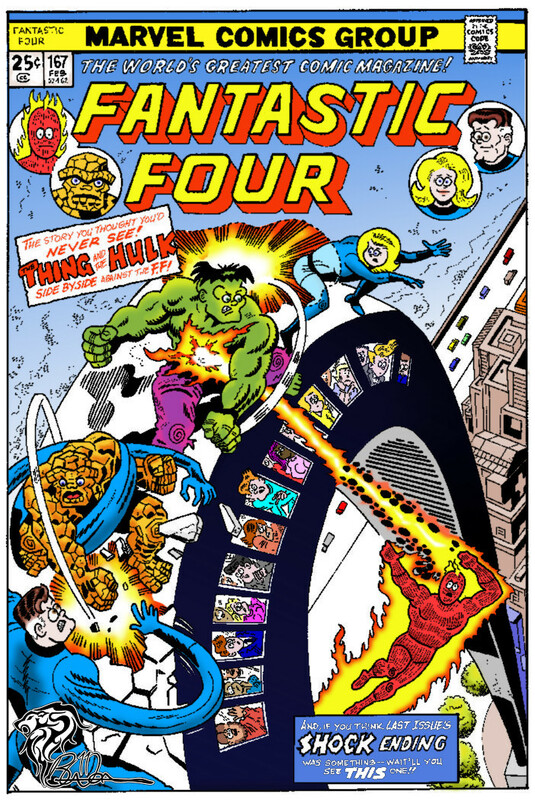 This began as a page layout for the Avengers Vs Fantastic 4 i think, but I thought it would work well as a standalone snapshot style image. I like the dynamic feel of Tom’s work, and Jarvis rushing the staff out of the room in the background is a great touch. 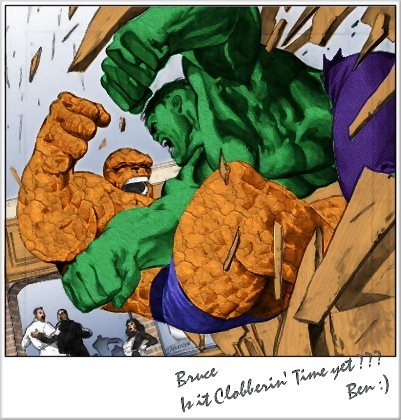 I thought it would be funny if this was Ben sending Bruce a little hint that he was up for a rematch, hence the handwritten message. Well I guess this could either be the sequel or prequel to my ‘Ben baiting Bruce’ pic. 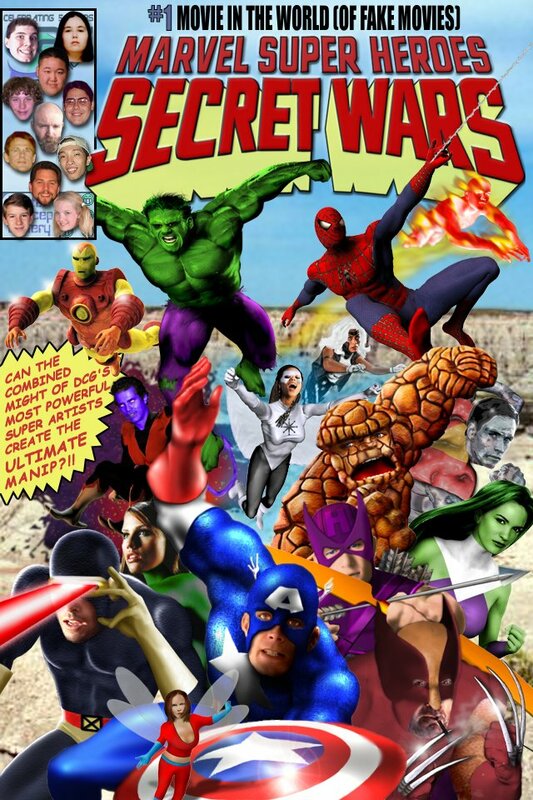 I think it works better as the sequel, given the newspaper article. 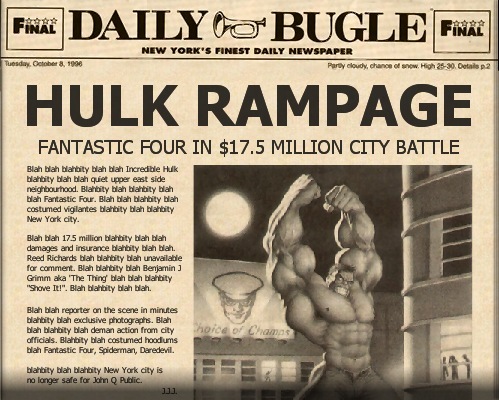 The Bugle front page was created from scratch using a black n white sketch of the hulk i downloaded ages ago which had a news photo quality to it. (I have realised this was by Jim Sweet). 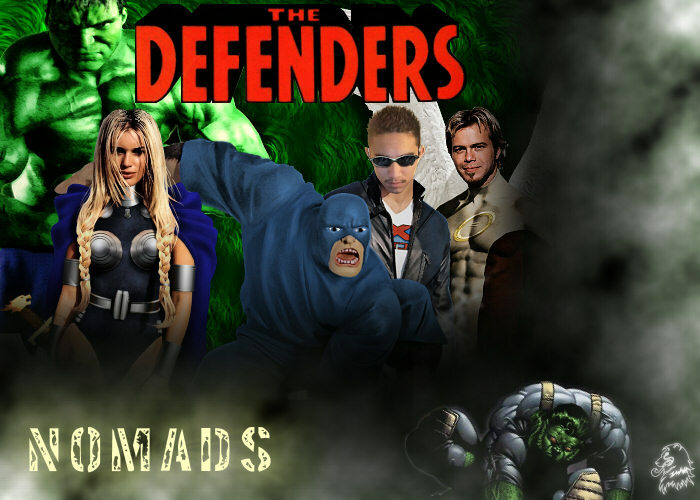 The banner (no pun intended) line logo was cobbled together from a couple of pics. The article text made up on the spot. 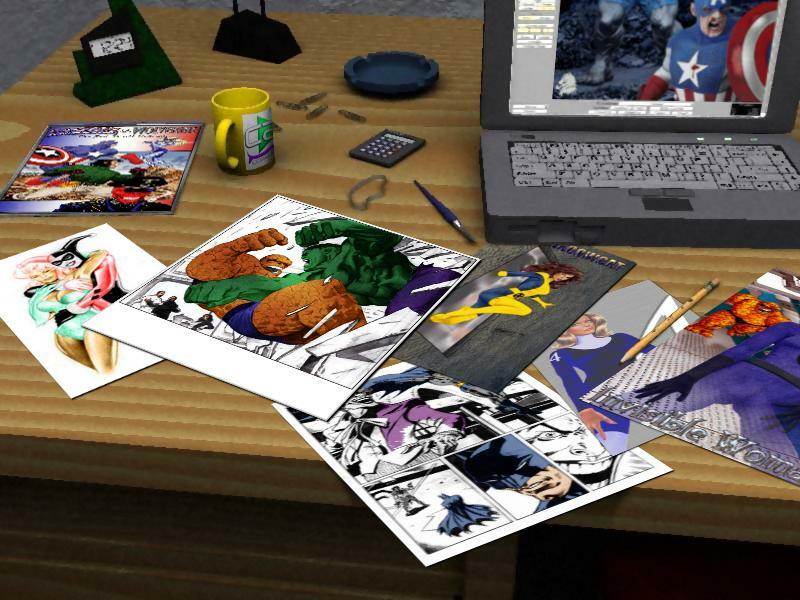 The desk also shows a couple of my Derenick/Hulk related pics. 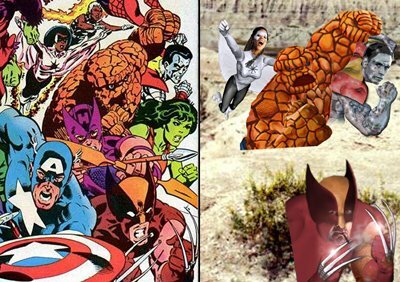 The small corner visible on the right is an Alex Ross recreation of the first Fantastic Four cover. An excercise in perspectives, but fun none the less. 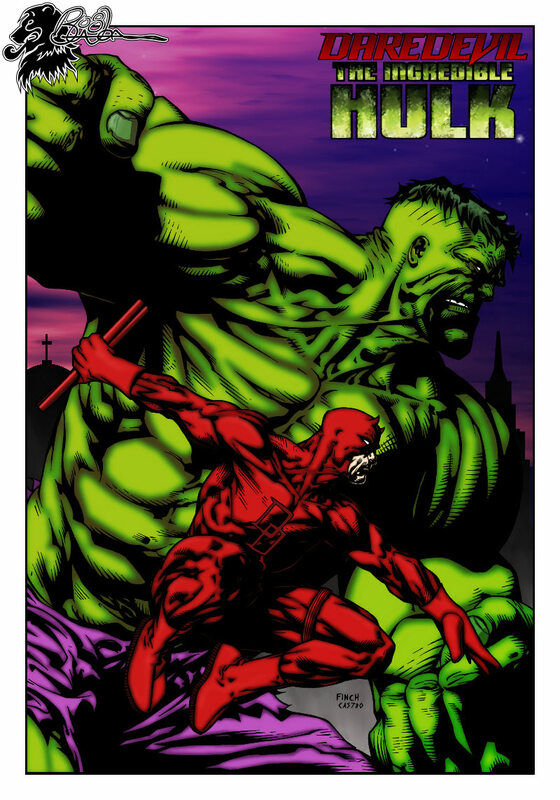 Just a cover concept for the adaptation of the HULK movie into a graphic novel. 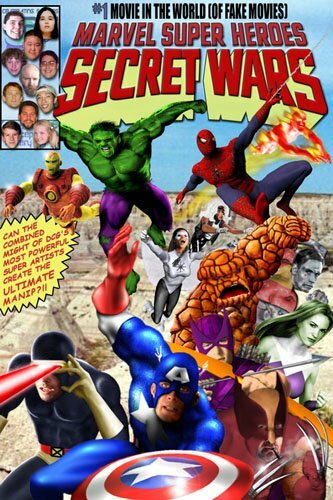 I think it kinda has an Alex Ross feel to it. This is the latest in my series of manips based on busts.. although the base pic for this wasnt a bust as such.. but a cookie jar!!!. 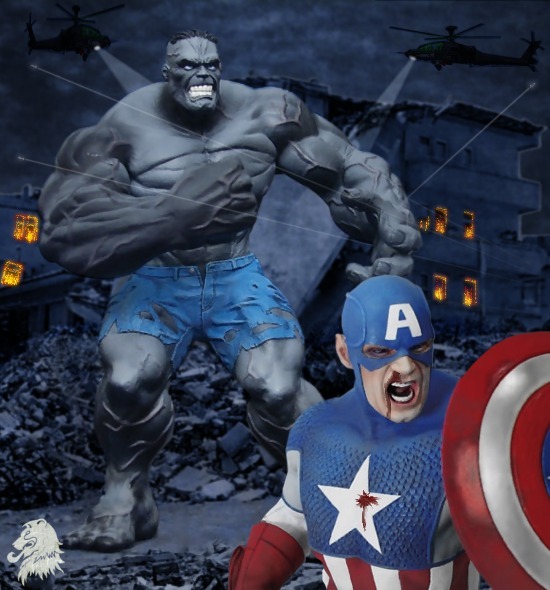 I found the base pic while browsing through a comic memorabilia store online, and it immediately caught my attention because of the quality of the sculpting. The first thing i had to do was remove the line where the lid (head and shoulders) and the body met using the smudge tool. I continued to smudge over the pic to get a more painted look. The bottom of the jar was smudged out to give the impression of paint thinning at the edges. Next I duplicated the layer, applied a gaussian blur of about 4, applied my own combination of brush stroke filters, and set the layer mode to lighten, this gave the picture a pleasing glow. 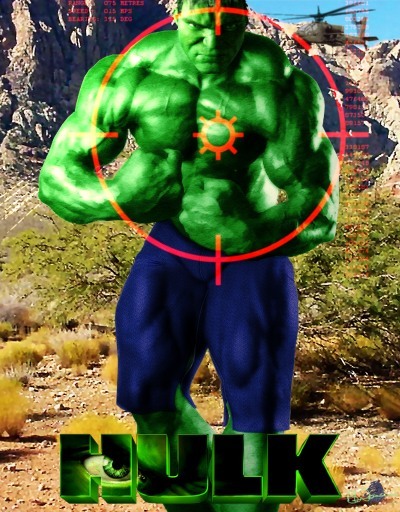 The Hulk logo was added and givem the same treatment. The ‘cloud’ box around Hulk is just that. It was a bluish picture of clouds at night, which again was given the paint treatment. 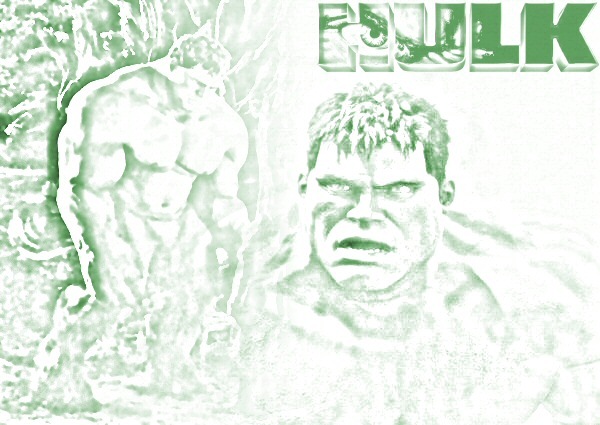 This was placed on a new layer over Hulk, with the mode set to exclusion, which gives the greeny faded look. The area directly over the hulk was cut away and the edges softened to accentuate the glow. Finally grabbed the marvel logo from their site. I think it turned out pretty nice, so i hope the rest of you like it too. 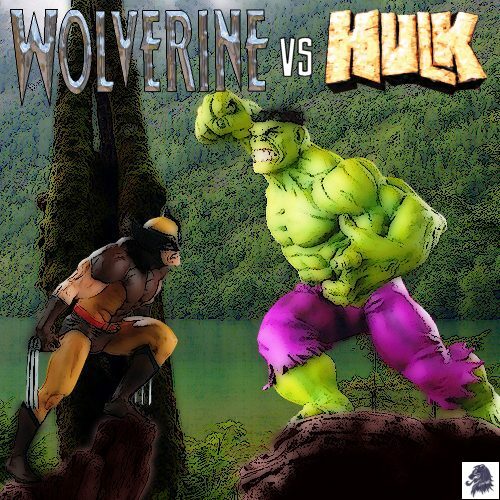 This is a varient of the first pic using Hulk and Wolvie busts to recreate their battle in the woods at the lake. The combined pic was then run through my ‘sloppy painting’ process to give the effect you see and I added the logos. I prefer this version to the first one, but what do you think? Another in my series of manips using busts as the basis for the picture. 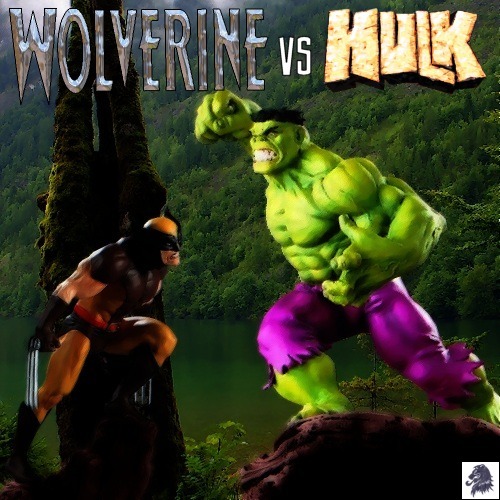 This is the first version of a pic using Hulk and Wolvie busts to recreate their battle in the woods, this time beside a lake. 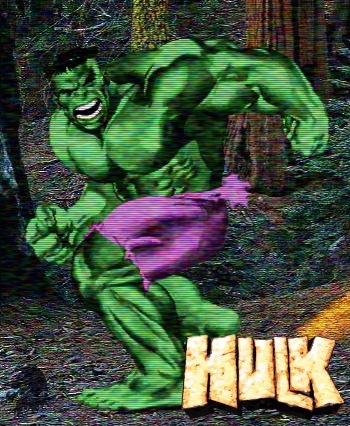 The hulk model is pretty much untouched other than altering the angle a bit to give more of a lunge. Wolvie I had to alter the angle of the head so he was looking upward slightly rather than down. The combined pic was then run through my ‘grainy drawing’ process to give the effect you see and I added the logos. 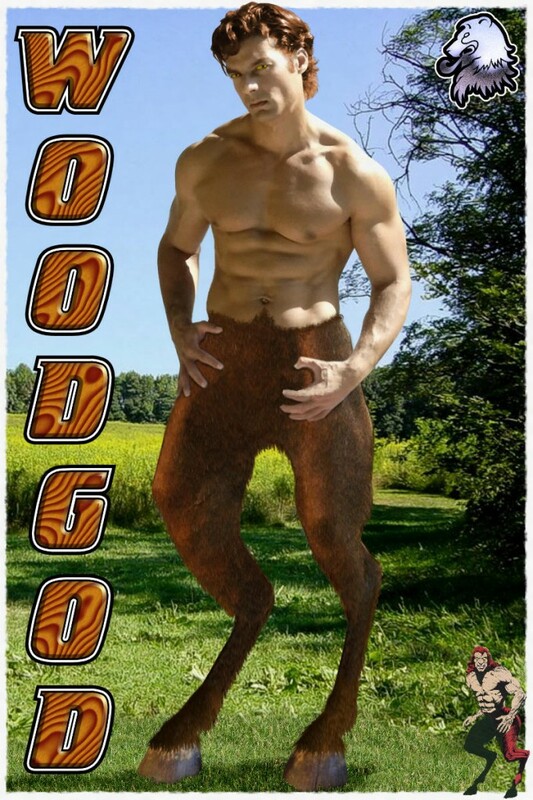 Theme day submission. 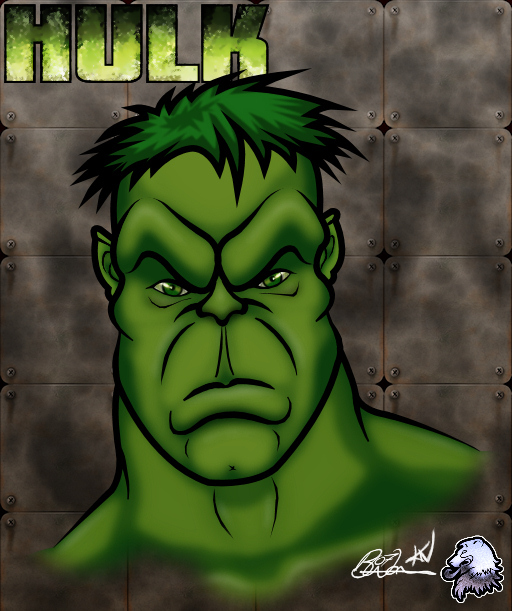 This started from the previous manip i did of the Hulk (based on a combination of a Randy Bowen Bust and a Jim Sweet statue). 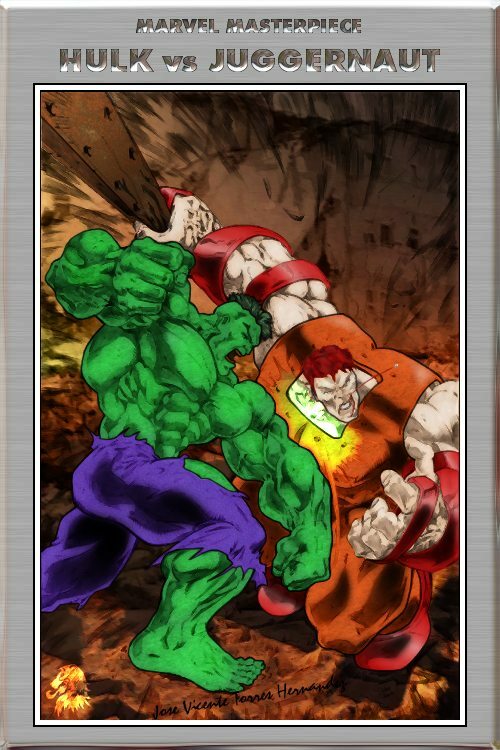 I found some good explosion pictures and decided to do the Hulks origin in the Gamma Bomb explosion. The explosion layers were built up to give it more volume. Banner was added at the very front of the explosion. 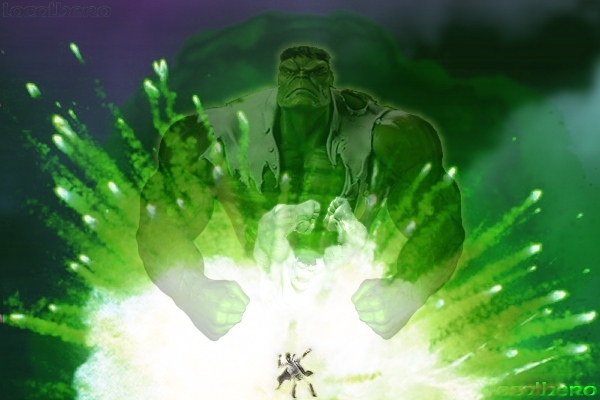 The smaller hulk forms part of the explosive cloud and came from a picture of a model i found on the net. A bit of blending, shading, and there ya go.